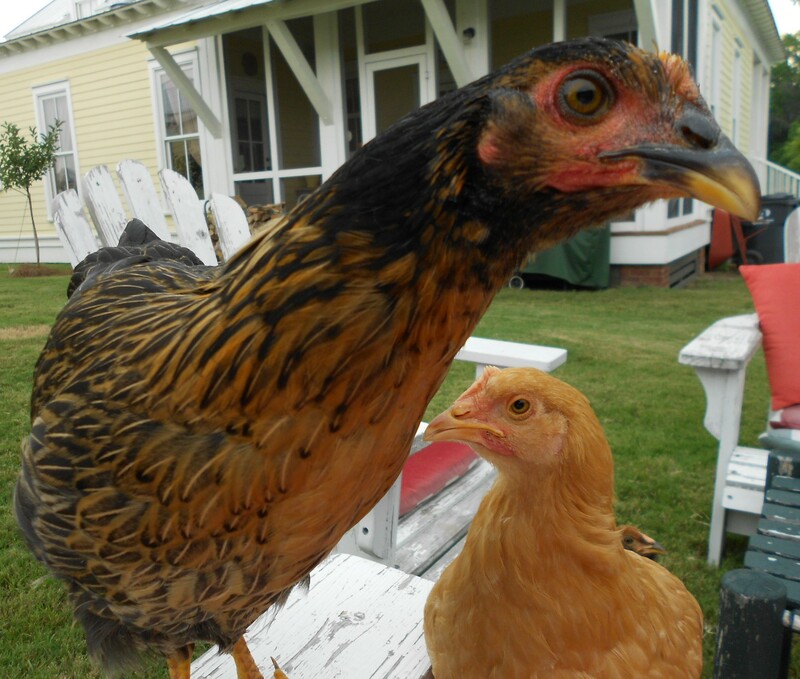 Many of the chickendiary readers contacted me yesterday to chastise my barbaric treatment of the girls. I must explain myself. First of all, I had an accomplice in this dastardly “swimming pool” incident. Tama, I hate to reveal your part in all this, but you know your involvement and you must stand with me in my shame. The whole experiment began as a pursuit of scientific facts. 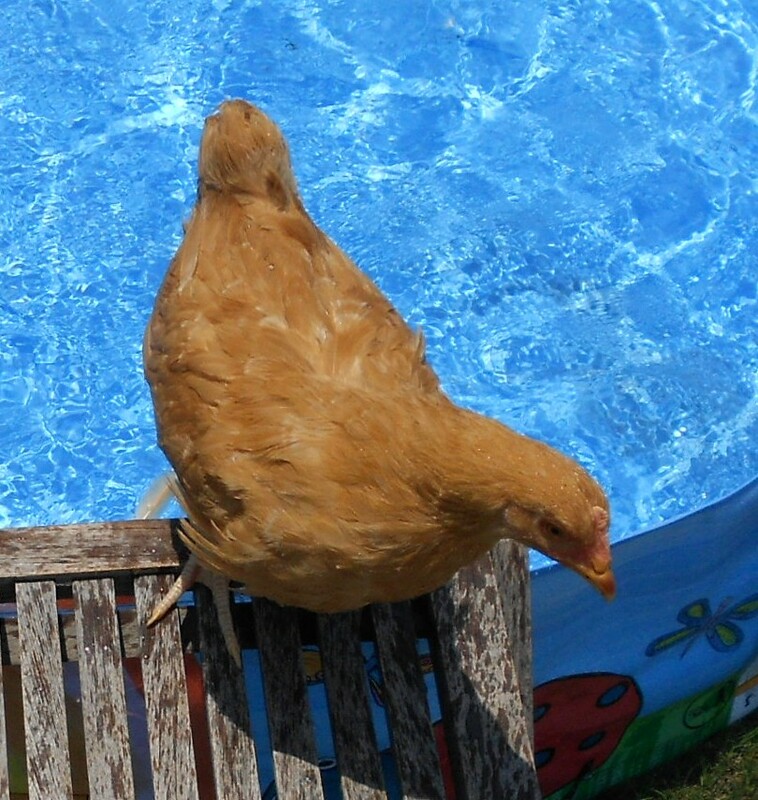 I googled “can chickens swim?” but could not find a definitive answer. So in my quest for knowledge (I am always questing), I filled my kiddie pool, called my partner in crime, and chose my first victim. Violet was the obvious choice because she is strong and brave and highly intelligent. She suffers from no timidity or paranoia (Rosie) and she hasn’t endured any physical trauma (Daisy). I instructed Tama on the use of our new camera. Jim had previously arranged it to take continuous pictures while you held your finger on the thingy (sorry for the technical jargon.) I placed my photographer on one end of the pool and I stood on the other, holding my beautiful, trusting, unwitting victim. As I gently lowered Violet in the center of the pool, she began furiously swimming back to me and NOT toward Tama and the camera. So the shots we were of her backside–not what we were anticipating. So you ask, YOU MEAN YOU MADE VIOLET SWIM TWICE? Yes, I am ashamed to admit, I did. This time I stood next to Tama and plopped Violet in the center of the pool for a second swim, toward the camera. Bingo! Great footage of the rare swimming chicken! Then I got a wonderful, awful, Grinchy idea. 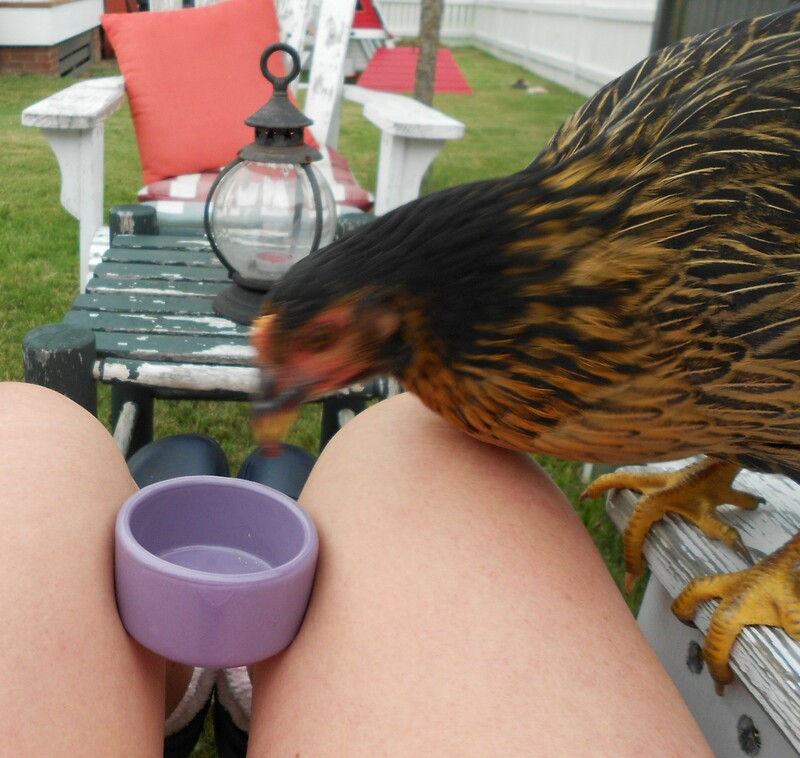 Why not see if two of my chickens could swim. If I’m in pursuit of a scientific hypothesis, shouldn’t I do another test to confirm my findings? I chose Daisy, because she has proven her strength in overcoming hardships, and she doesn’t seem to have any psychological problems that might be worsened by a dip in a baby pool. We performed the experiment on my little yellow girl and she outswam her alpha sister by a mile. She even used the chair as a platform to exit the pool. Her swimming wasn’t as frantic as Violet’s, and she even seemed to enjoy it for a few seconds before she realized that chickens don’t like to swim! I fear from some of the comments yesterday that I will soon be visited by the SPCA. I wish to assure readers that Daisy and Violet were paid in a ridiculous amount of grapes and strawberries for their participation, and within 10 minutes after their ordeal, they were clamoring on my lap for fresh fruit. My Dear Aunt Carol compared me to Joseph Mengele for my actions! C’mon now, the Angel of Death? Really? Rest assured, the girls will never take another dip on my watch. My quest for knowledge has been quenched, and I have been chastised for my actions by a concerned readership. And Tama, if I go down, I’m taking you with me! Thanks Aunt Carol. I’ll try to be good from now on.